Commonly called Red-winged Parrot, the Aprosmictus erythropterus Gmelin, 1788, belongs to the family of the Psittacidae. It was studied in 1778 by the German biologist, zoologist, entomologist Johann Friedrich Gmelin (the same who described the life, the reproduction and the behaviour of the Mute Swan, Cygnus olor), who described it, with many additions and modifications gotten from his explorative trips in Australia and New Guinea, in the famous Linnaeus’ work Systema Naturae. Autochthonous and native to Australia and New Guinea, even if for commercial reasons is now found in almost all the world, Europe, Asia, Americas, Africa, in breeding or in the houses as ornamental animal. If kept in cage, they need aviaries of at least 2-2,5 m of height and 3 m of length, in order to guarantee them sufficient room for flying and consequent good psycho-physical conditions. The aviary must be well sunny, aerated, and not in contact with the ground, as the species is easily subject to vermin. When in the wild, they fly between the branches of the various species of trees present in the pluvial forests of New Guinea, or in the woody areas of Australia. Less frequently, they can be encountered also in the desert hinterland of this continent. They have a splendid plumage with bright colours. 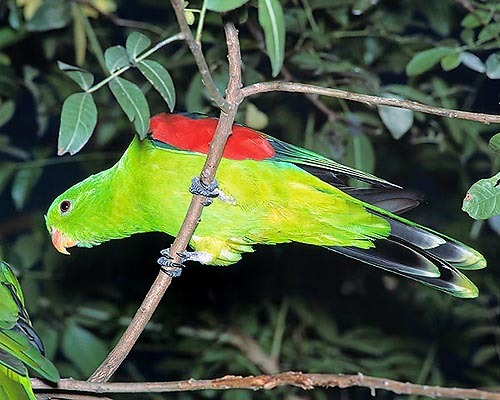 The male is mainly green with almost fluorescent tones and the vane feathers of the wings are of a bright red colour, from which the name of Red-winged Parrot. They have a black dot on the back, whilst beak and iris are orange. A certain dimorphism is present in the females. The red dot formed by the vane feathers is reduced, they have a brown iris, and the green of the plumage is less bright, with touches of a yellowish colouration like the young males sexually immature. The dimensions vary from 32 to 36 cm of length, with a weight from 150 to 200 g, the males being somewhat bigger than the females. They can live 20-25 years. The foot has a zygodactylous morphology (first and forth toe directed backward and second and third forward) for granting a solid grip on the trees, seen its arboreal life. The Aprosmictus erythropterus are mainly granivorous, frugivorous and phytophagous. When in captivity, it is a good thing to balance their diet with seeds, for instance, of hemp with carrots, fresh green vegetables and legumes (for ensuring the right contribution of mineral salts and proteins), fresh fruits (better if stone-fruits) and dried ones. Usually, the mating season lasts from January to February, the female lays 2 to 4 eggs for each brood. They are very friendly towards their conspecific, but especially the males become very aggressive during the mating, both towards the conspecific and towards other species of birds, other Psittaciformes included. The beginning of the mating season and therefore the male’s heat is easily perceived, as it becomes more and more nervous and aggressive, jumping, when in presence of a female, from a branch to another, in order to be visible and to invite the female for the coupling in the nest it has prepared. If not immediately corresponded, it may become violent with the mate-to-be, till when the same does not decide to enter the nest. The female broods the eggs for about 24 days, nourished by the male, which is also busy in feeding the pullets, as are called the just-born small parrots. During this time, the male is particularly affectionate, both with the mate and with the offspring, which grows up very quickly. Both males and females of Aprosmictus erythropterus reach their sexual maturity, marked by the final plumage, by their third year of life. When born, the pullets have, like other species of birds, a considerable disproportion between the volume of the head, with a big yellow beak, and the remainder of the body. The neck is short, there is a very thin temporary plumage, which gives a slight bluish colouration and the skin around the orbit has the same colour. The iris is temporarily black. Usually, the take-off of the pullets happens by the fifth week of post-natal life. During this stage, the kids are followed very carefully by both parents, during each displacement. They are fed for about twenty days more, till when they are able to fly autonomously looking for food. The CITES watches closely the population dynamics of this species, which, even if not yet under risk, needs a strict control on its traffic.